This remarkable 21 Year Old from Benriach Distilery was first matured in the traditional style - American bourbon barrels and then finished in a small batch of top-quality Tawny Port casks sourced from the Douro region in the north of Portugal. During this second period of maturation, the slow interaction of the whisky with the Port cask results in sublime flavours and aromas. 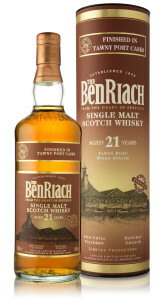 Bottled at 46% ABV, this Benriach 21 year Old is a phenomenal Speyside single malt and one for all whisky lovers! Nose: A perfect balance of fresh cranberries and warm white pepper develops into an equally perfect combination of tart raspberries and boiled candy. Palate: Delicious toasted oak spices and hints of orange peel develop to a lively contrast of wild red berry compote and sour cherries. Finish: The red berry compote and sour cherries are immediately followed by a rich stewed barley character throughout the finish.